Background: Propolis, a honeybee product with plenty of biological properties, has displayed a major role in drug discovery because of tumor cells resistance to chemotherapeutic agents and due to limitations of some drugs. Caffeic Acid Phenethyl Ester (CAPE) derived from propolis also possesses a variety of pharmacological properties including anticancer activity. Breast cancer, the most frequently diagnosed neoplasia and the leading cause of cancer death in women worldwide, is a heterogeneous disease with different clinical presentation, evolution and response to treatment among patients. Objective: Considering the antiproliferative effects of propolis on certain neoplastic cells, an attempt has been made to evaluate its inhibitory activity in the growth of breast cancer cells lines, what may provide new insights for breast cancer therapy. Conclusion: Propolis extracts may be important economically, allowing a relatively inexpensive cancer treatment associated to lower concentrations of drugs. 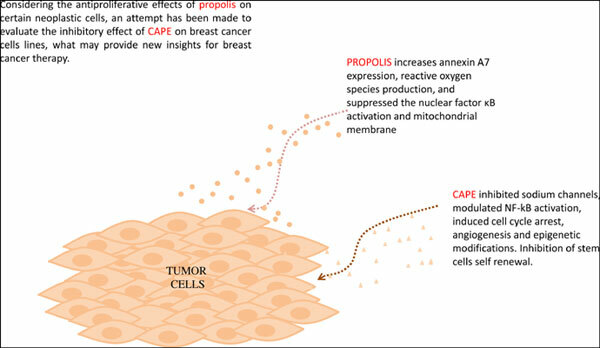 In this review, the activity and mechanisms of action of propolis and CAPE on breast cancer cells are discussed. Propolis, caffeic acid phenethyl ester, breast cancer cells, antitumor effects, apoptosis, cell cycle arrest.